Stories inform our understanding of the world around us. Stories are critical to understanding our past, fully engaging in our present, and formulating our hopes for the future. 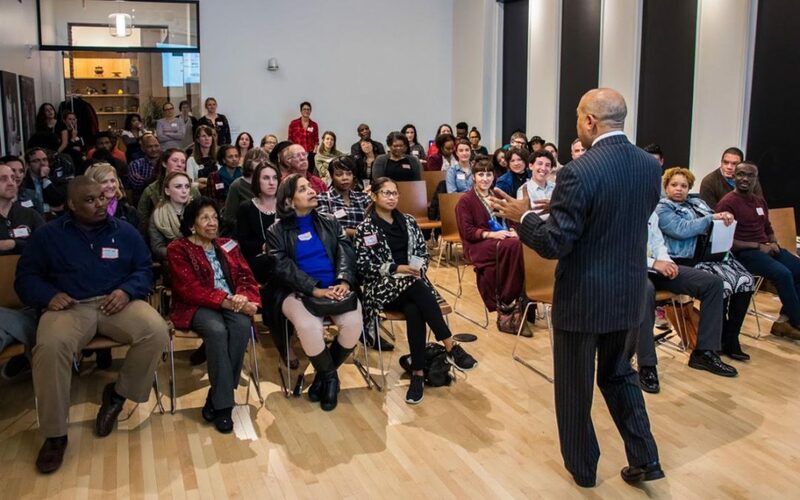 Wednesday night, February 22, 2017, people from all over Richmond gathered to discuss the challenges of developing a holistic story, the danger of limited perspectives which give way to stereotypes and biases, and also the work that is required to obtain a holistic view of any particular account. The theme of the night was turned into a call to action, an active awareness of the work needed to complete our stories, challenge our comprehension of our shared history, and look for areas where there may still be essential perspectives missing from the storyline. We started the evening by screening a TED talk by Chimamanda Ngozi Adichie. In her talk, The Danger of a Single Story, Adichie reminded us that our own preconceptions about a fellow person’s experience may not, in fact, be that individual’s experience. Although it may be natural for us to believe that our experience serves as a basis for any general person’s experience, it’s up to us as individuals and as a community, through communicating our individual and shared experiences, to inform the true nature of a total narrative. Community leaders, poets, journalists and other professionals in the Richmond writing world were present to help attendees dig deeper into their own experiences and understanding of what it means to fill the gaps in our stories through small group informal discussions. After taking some time to explore the permanent gallery of the museum, Gary Flowers enlightened Salon participants by noting fresh angles on familiar historical stories, and by connecting our colloquial familiarity of various topics to the profound roots that give them broader meaning. The night closed with a screening of Clint Smith’s TED talk, The Danger of Silence, in which viewers are warned against the consequences of not communicating our truths and stories, leading us as a community to embrace our roles as the storytellers, and take an active role in facilitating a more complete understanding. It’s our job, as a community, to complete the story of Richmond. Our hope for these Salon events is that they spread ideas, spark discussion, and encourage us all to get involved with the amazing groups doing exceptional work in our city, and help bring these ideas to life. Special thanks to the Black History Museum and Cultural Center of Virginia for hosting the event, Mosaic for providing a bright mix of tasty treats for attendees to enjoy, and to Gary Flowers and family as well as Dr. Carmen Foster for leading us in an exploration of Richmond’s record.